This isn’t true of everyone – a couple of my students really don’t enjoy books, but if you only think of the English books that you had to read at school, you may find that you do actually enjoy reading English if you choose the book yourself. I wouldn’t enjoy reading some of the English books that young people have to read at school! As a language learner, books have been, and continue to be, a great source of inspiration, vocabulary and enjoyment. Reading in German has helped me to increase my vocabulary and get a better feeling for how words and sentences fit together. We’re going to be talking about audio books in the listening section, but if you don’t want to read the text yourself, audio books are a great alternative. If you don’t want to read stories, try something factual about a subject that interests you. If you don’t enjoy books, there are plenty of other things that you can read such as articles about your industry, hobbies or interests. 1. Find something that is interesting. If you wouldn’t enjoy it in your native language, there’s a good chance that you won’t enjoy it in English either. 2. Decide how you want to consume the material – hard copy, ebook, audio book – they all count as reading. 3. Remember to have the book close at hand. If it’s on your phone, it’s with you anyway and you can read it if you find that you have some spare time. If your bag is big enough and the book is a hard copy book, pop it in your bag and take it with you. 4. Try to set aside some time for reading. 5. If talking with others would motivate you, try to find other people who are reading or have read the book so that you can discuss it with them. 6. If you’d rather read articles, which are great if you don’t have much time or you find books more difficult, like or follow pages on social media that will put these articles into your feed. 7. Sometimes it helps if you know the story. You can try reading books that you have already read in your native language or the books behind films that you have already seen. 1. Don’t choose a book that is too difficult for you in terms of language. If you have to look up every other word, it will frustrate you and you will feel that reading the book is a chore. 2. Don’t choose books from several hundred years ago unless you have a specific interest in the history and language of that period. Language is a living thing. It changes. Don’t be surprised if you can’t understand the way people spoke in the past, even if it comes from a classic that you think you should read. 3. Don’t write down every word that you don’t know.You’ll probably never need those words again and because of that, you won’t remember them. Be selective when it comes to looking up and writing down new words. 4. Don’t start with a book that’s really long – if you haven’t read many English books before, start smaller and work up to longer books if you want to. 5. If you’re not enjoying the book, find another one. I usually give books 1 or 2 chapters to convince me, but if I’m not enjoying it, I won’t struggle through to the end. There are too many interesting books out there to waste time on things that are not interesting. 6. Don’t expect to understand everything if you are reading really technical articles or documents. If you need that specific vocabulary, great, you can learn it. If you don’t, move on to something else that is more relevant. 7. I love to read blogs about all kinds of things and they are a great way to learn more about a topic or find out how people write, sometimes informally. But don’t expect that all native speakers write well. Don’t believe that they never make mistakes when it comes to using their own language! That’s not a reason not to read them, but try not to copy the mistakes! If you want to read some more tips on finding things to read, you can visit this article on reading. Your task today is to identify one or two things that you want to read in English over the coming weeks, and set aside some time to read them. 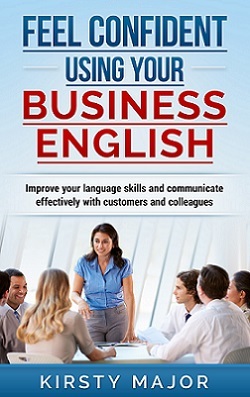 By the way, if you want to read something about improving your business English, I wrote an ebook on this topic. You can find out more about it here.